Nintendo's Switch console goes on sale Friday in a global launch seen as key for the Japanese videogame giant to reverse flagging sales and compete with Sony's top-selling PlayStation 4. The $299 unit, which works both at home and on-the-go, blends the Super Mario maker's history in the console business with its fledgling mobile gaming strategy, which got a big brand win after Pokemon Go's success last summer. Kyoto-based Nintendo is aiming to sell more than two million Switch consoles in its first month. Strong demand for the new unit would help Nintendo close the book on poor sales of its last console, Wii U—the disappointing follow-up to the smash hit Wii, which sold over 100 million units worldwide after its launch a decade ago. Switch has a removable screen that lets players dock it at home and also use it on the go like a tablet with detachable controllers—called Joy-Con—on both sides. The idea is to give gamers a more immersive experience with realistic physical sensations matched to what is happening on-screen. A remote control feature means players can take their eyes off the screen to face off, punching the air in a boxing game or getting into a gun duel. In past years, Nintendo has scored hits with traditional home consoles, such as the Nintendo 64 or GameCube, and portable devices likes GameBoy and the DS handheld. "Switch is probably one of the most important consoles for Nintendo in the past decades," said Serkan Toto, a Tokyo-based games industry consultant. "(It's) the first time where Nintendo basically combines portable games and home console games into one device, into one platform." But trying to score a win in two different markets is risky, Toto added. "Some people could say that Nintendo is trying to kill two birds with one stone and that it could actually land in the middle and not really catch any of the target groups," he said. Investors have been underwhelmed so far. 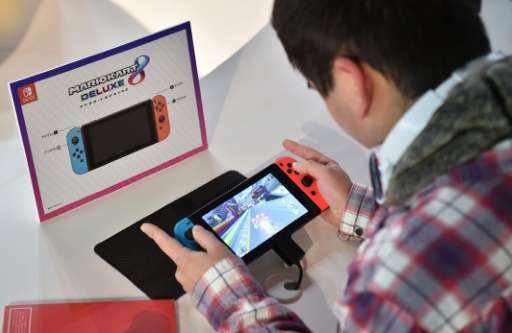 Nintendo shares are down about 15 percent from October, when the firm gave gamers a sneak peak of its newest console. While it has dipped a toe into the mobile gaming market, the Nintendo also needs to keep up with console maker rivals Microsoft and Sony, which has racked up huge sales of the latest PlayStation—it has sold more than 53 million units globally since its debut in late 2013.